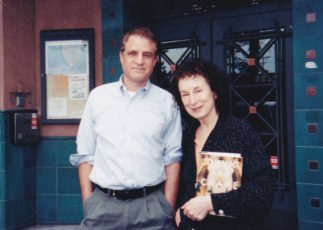 Richard Wolinsky and Margaret Atwood in 2008. Margaret Atwood, interviewed February 22, 1989 in San Francisco, focusing on her two most recent novels, The Handmaid’s Tale and Cat’s Eye. In the interview she also discusses her early career as a writer, feminism, her views on being a Canadian writer, and other topics. She was interviewed by Richard Wolinsky, along with novelists Richard A. Lupoff and Lisa Goldstein. The interview was digitized, remastered and re-edited in 2018 by Richard Wolinsky.